Just before the Passo Giau you face the option to go straight ahead for the 108km route or turn right for the Maratona route and the Giau. I came here to do the long route and never give up on anything that I start, however you cannot help that feeling of self-doubt and questioning yourself. 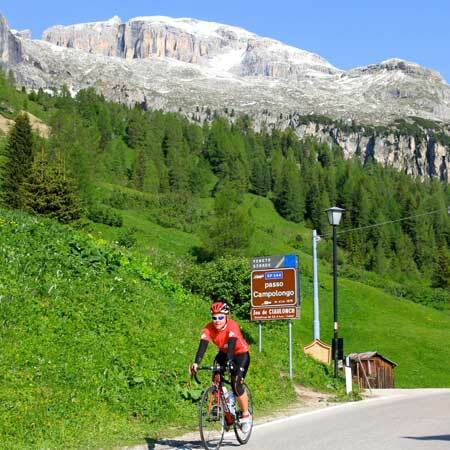 In our latest “Rider’s Eye View” Guest Review we asked Brevet guest Jennifer Collier to share her account of riding the peerless Maratona dles Dolomites in Italy. The Maratona – wow! What can I say? Six months later and I still have that post-holiday feeling and long to go back! If you love sportives or just cycling in general, this one is a “must do” that definitely needs to go on your bucket list. I am not really a newcomer to cycling in Europe – well for an Aussie anyway! I have ridden the Etape, La Marmotte (twice), London to Paris as well as numerous other cycling tours including the French Alps, Pyrenees, Italian Alps and lakes and Lanzarotte. However my holiday with Brevet to ride the Maratona certainly tops them all! The trip started with a very long flight from Melbourne Australia arriving late on Tuesday night. I was transferred from Venice Marco Polo with the Brevet Team on Wednesday morning. I was still pretty jet-lagged. When we arrived in Corvara it was just like a dream! The Dolomites were truly amazing – so beautiful and in a different way to either the Alps or Pyrenees. The plan was to get a ride in that day, climbing the Passo Gardena from the side we would be descending in the race. I always get a little nervous before the first ride of a tour with the fear that I will be left far behind and have everyone waiting for me. I am also always a little afraid to get back to riding in groups – I struggle to keep up with bunches where I live hence do most of my rides by myself. I was also very nervous about the weather (as much as I love cycling I hate and fear it in the cold). The heavy snow that re-routed the Giro away from the Giau just a month earlier was still on my mind. But the Brevet guides always kept us well up-dated on the conditions. We did have snow that week, with one day being quite bad, but we still managed to get out on the bikes every day. Brevet’s local knowledge was invaluable – still finding a lower but very scenic climb to do on the ‘bad’ day. Coming from winter and not much recent climbing it was great to be able to do most of the climbs in the week before the race. Our hotel in Corvara, La Tambra, was a fantastic choice. Dinner on first night was an eye-opener – I was not expecting this kind of first class catering! This can be said about all the meals – have never seen such a spread for breakfast in all of my travels. The Brevet Team had also arranged optional morning yoga classes and massage which was good. The rest of the week past by so quickly and soon it was time for the Maratona dles Dolomites. The race began in the town of La Villa so we had a very early breakfast before the short descent from Corvara. It is hard to get a good starting position within your grid. Luckily we arrived early as the place was packed – have never seen such a long line of cyclists in my life! The start was surreal. Over 9,000 riders watching the sun rise above the most beautiful mountains in the world. There was music and other entertainment and the atmosphere grew as the TV helicopter flew above. Finally the Italian countdown was over and the crazy start began. This was definitely the closest and most crowded (with cyclists) road I have ever experienced. I got caught up amongst the excitement and rode well above my planned pace from the start. Passo Campolongo was over before I knew it – it really helped doing this climb numerous times in the preceding days. I had planned on making a fast descent into Arabba – however this is where I realise the truth in the comments from the Brevet guides about Italians descending! The really have no fear – it was quite scary with so many passing me at such a rapid speed! Passo Pordoi on the other hand was a struggle for the legs as my energy levels were getting quite low. Still it was so enjoyable – now I consider this as the most stunning climb I have ever done. I realised on the Passo Pordoi that I had probably gone out too hard for the Campolongo. I was passed by quite a few other Brevet members and their encouragement helped to get me up still in good timing. I definitely made sure I had heaps to eat on the Pordoi (Italian feed stations are amazing! –better than the French do). The descent of Pordoi was very cold as it was in the shade being still so early in the morning. I descended shivering and very slow; unfortunately I passed my first accident here as well. Passo Sellla was quite hard but my energy levels had really picked up. This climb is also one of the most beautiful that I have ever experienced. Passo Gardena almost passed unnoticed. The long descent from there brought the route back to Corvara. This is where your head plays game with you. In Corvara you ride close to the finishing stretch and there are many arriving at the end of their shorter Sella Ronda loop. It is hard knowing that you have to go back up the Campolongo for a second time and also still have the two toughest climbs of the day left after that. Having someone there to cheer from Brevet really helped on the day and we had an option to leave clothing that we no longer wanted to carry around. At the top of the Campolongo the second time round there was a well-stocked feed station so I stopped here to refill my bottles and eat . I was kind of dreading what lay ahead as I was still not feeling the best. Just before the Giau you face the option to go straight ahead for the 108km route or turn right for the Maratona route and the Giau. I came here to do the long route and never give up on anything that I start, however you cannot help that feeling of self-doubt and questioning yourself. I turned right and after a quick descent hit Passo Giau – bang! Straight into a wall. I knew that this climb got to a max of 15% but wow! It felt steeper than the Mortirolo! I remember getting straight into my smallest gear and wishing straight away that I had more. There were heaps of people around me walking already but I am always determined not to let a climb do this to me. I kept trying to remind myself that it was nothing – only about 10km the same as my hometown Mt William that I love to train on. Passo Giau was really beginning to look like Mont Ventoux when I did the Etape – carnage, it was hot and people really looked to be suffering. I remember being in a daze and suddenly hearing “go Jennifer” and other encouragement in an Italian ascent from an official on a motorbike. I soon realised it was local rider Richard, one of the Brevet guides that week, who was on teh course taking photographers! We had a quick chat and I picked up my pace. This is another special thing about the Maratona – the whole region gets behind it and helps in any way they can. Finally made it to the top of the Giau and I just had to stop for that all important photo to add to my collection. The scenery here was amazing – the surrounding area being still covered in snow from the previous days. I descended the Giau very slowly after seeing a very bad crash. I made it to the Passo Falzarego and loved it as it felt so easy compared to the Giau. The finish area in Corvara was amazing – so many cyclists and everything you could need for recovery – the apple strudel was awesome! We also had our Brevet Clubhouse where we could leave our bikes and relax with a well earned cold beer. This is definitely a trip that I will NEVER forget! If you love mountains like myself and haven’t been to the Dolomites you are missing out. The scenery here is absolutely stunning! Also It is hard to fault the Maratona as an event in any way. The organisation is excellent, right down to the eco-friendly gilet provided! I can highly recommend Brevet for their Maratona trip as well. The people are so supportive and take care of everything, including for example a bike clean before the event – so so important in Italy! I did the Marmotte a week later with a very large company and this really made the special treatment we received from Brevet stand out. Inspired by Jen’s Maratona dles Dolomites review? 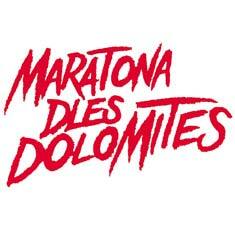 As an Official Maratona Tour Operator Brevet has a guaranteed Maratona dles Dolomites entry slot waiting for you.